As I raise my children, I try to set a good example for them as one who claims to be a follower of Christ. I am more successful in some areas than in others, of course. Because we homeschool, they have walked with me through nearly every day, good and bad, and have seen how I've dealt with difficult situations and people. Sometimes we talk about what has happened, because I want them to understand why I handled a particular scenario as I did, or how I could have done better. I tend to lecture, to talk too much, in an effort to illustrate my point, particularly if I feel passionately about an issue. 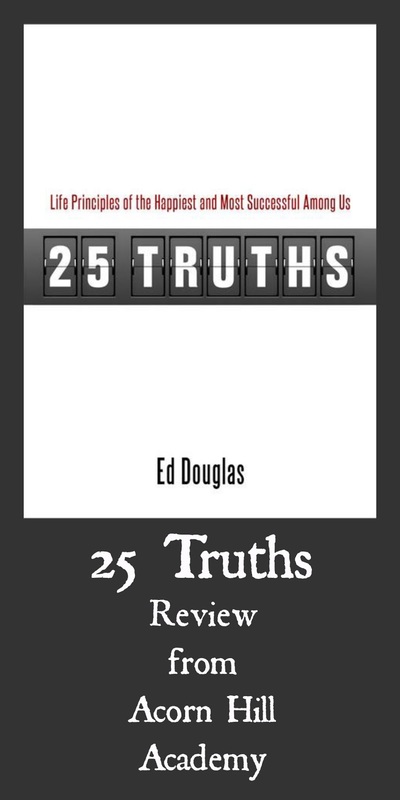 I was recently given the opportunity to review the book 25 Truths from Ed Douglas Publications through the Schoolhouse Crew, and was pleased to find some assistance in keeping the lectures short, along with ways to engage my children in discussion. Ed Douglas retired in 2006 from being Chairman and CEO of Citizens Bancshare Bank, and now owns Ed Douglas Certified Financial Planning/Consulting. 25 Truths is his 3rd book. He gives financial seminars for adults and also speaks to students on financial issues. He's been appointed to statewide positions in the state of Missouri. He serves on boards and would be considered Important. He's the kind of guy who has the credentials to speak about how to be successful. (You can read his bio here.) He is also married, the father of three grown children, and a Christian. He has made his faith and his family priorities in his life, which means he's made some very different choices than many of the "successful" people you see on the news. 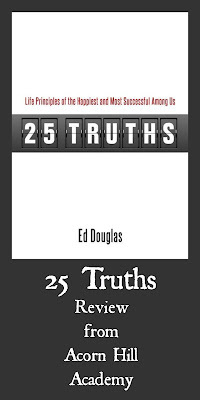 This book, 25 Truths, began as a list of life principles Mr. Douglas had put together and would share with family and friends. The list evolved into this book. Each truth is presented with a corresponding Bible verse or quote, along with a short reading, usually including a story from Mr. Douglas's experiences. Following each one is a summary, in which the chapter's principle is reworded and perhaps clarified a bit, and then the Workshop, which includes questions to encourage thoughtfulness and discussion. When my girls and I went through this book together, we read one principle each day. Their responses were so interesting! From the very first truth - "Protect Your Reputation" - we had great discussions. They didn't think they had reputations at this stage of their lives (they are 12 and 13). As we talked about it, though, they were able to see that even as young as they are, they have reputations within our extended family, our church, and the groups in which they participate (choir, ballet, gymnastics, etc.). They could also see how easy it is to lose a good reputation, and how important it is to protect one's good name. It's suggested that this book is best for grades 6-12, and I think that's pretty accurate. As I went through the book with my girls, I saw them making connections with the principles - in many cases, these were things they already knew on some level, but the simple phrases allowed us to bring them to the forefront for more careful consideration. This book would be a great tool for a youth group or college Bible study, or any group, really. Mr. Douglas mentioned using it with the high school tennis team he coached, and I thought that sounded like a perfect venue. If the book were to be reprinted, I'd love to see more careful editing - I noticed several typos throughout, and thought the writing could be smoothed out in some places. Overall, though, this is an excellent way to spark conversation on some basic life principles with people at almost any stage of life, whether they are learning what it means to live life to the fullest, or perhaps need to be reminded. You can purchase 25 Truths for $12.50 from the 25 Truths website.